Commonly considered one of the most beautiful and desired decor items, outdoor fire features make lovely additions to any patio. We carry an extensive selection of fireplaces, fire pits, features and accessories to help you achieve the perfect look for your backyard. With our wide variety of products, you can find everything you’re looking for and ensure that your new fire pit or other fire feature will serve as a beautiful addition to your home for many years to come. Fire features can make a statement in any outdoor environment. A large, concrete fire bowl may be a suitable addition to your business decor ¬— or you can make it centerpiece in your yard to wow visitors and passersby. 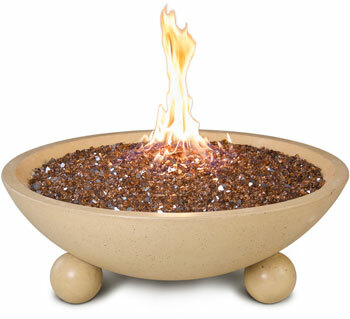 Or, a series of smaller fire bowls can highlight your pool or other water feature. We also have many stunning copper fire features that can highlight any landscaping. No matter what your décor or environment, a fire feature gives that special touch that turns a common backyard into a truly unique outdoor design. For builders and more “hands-on” homeowners, we have do-it-yourself fire pit kits that you can build to your exact specifications. Ask us about our DIY Fire Pit Kits today – 941.706.6359. When you need accessories and supplies for your outdoor fire feature, look no further. Relax and browse through our variety of log sets, fire glass, lava rocks, and more that will help you get the perfect, cozy look you desire. We also carry high-quality fire tables and accessories in a variety of styles to match any theme. Complete your space with torches, candles, and columns that will accent the look of your fire pit. If you need to make repairs, replacements, or upgrades, we have a great selection of parts as well, from panels to racks. Looking for something truly unique? Try our stunning combination fire and water features and watch your backyard come alive! Our selection of truly unique tiki torches sets us apart. Unlike the torches you can find at any hardware store, our tiki torches (along with all of our fire features) feature unique designs to highlight your outdoor space. Plus, with our tiki torches, you won’t have to rely on messy and potentially dangerous oil that you have to refill often and light manually. Our offerings are all compatible with both propane and natural gas setups and come with automatic lighters. With a simple flip of a switch you can light up the night with your unique fire design. Providing Southwest Florida with top-of-the-line fire features from Bradenton to Naples! Located in Port Charlotte, FL. Talk to us about our fire features, today!